We offer better garage door opener service and replacement throughout Encino. With over 10 years serving our customers you won’t find a better garage door opener repair company than Magic. Our technicians are experts and have been in the industry a long time. With the factory training they receive, they are the finest garage door technicians in Encino. Our technicians update their skills regularly and have factory certification for all the modern garage door opener makes and models. When you look at the variety of openers and operators available that really says something about their commitment. It also means if your garage door is under warranty, they can do warranty work. We receive referral work from satisfied customers like you because we understand what you want. We work very hard to deliver the level of service you deserve with no hassles or hangups. Magic is the garage door repair company to call when you have garage door problems. If you need an emergency garage door opener repair or replacement attended to right away, call our dispatcher and our professional technicians will be over in less than 60 minutes. Mentioned before, our technicians are factory trained. This means no matter what the problem is on any garage door opener you may have, our techs will get it working quickly and reasonably. Factory trained means they are certified to work on your brand name, make, and model. This is a big difference hiring Magic Garage Door can make for you. We guarantee our talented garage door opener technician to be at your residence or business location within 60 minutes after you call Magic. Keep in mind we also offer garage door installation in the Encino area. With over 10 years experience with every type of garage door we will save you money. At Magic Garage Door, we deliver that to both residential and commercial clientele. We are always bringing our inventory and methodologies up to date with what we offer to meet your changing technological demands. Each client is unique. Every home or commercial property is different too. Our professional staff will show you all the styles, options, as well as the variations available for garage door openers and operators to guarantee your satisfaction for decades to come. If you don’t know the options, can you make the right choice for your home or business? Garage door openers and operators were uncommon just twenty years ago. They were considered a luxury for wealthy people. Today, garage door openers and operators are a standard feature for residential and commercial real estate. Garage door openers have come down in price because of demand and now come with features that would have been inconceivable 20 years ago. 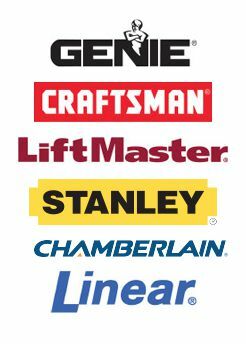 Manufacturers such as Genie, Chamberlain, Odyssey, and Lift-Masters t products are among some of what we offer. Each model is available in belt, chain, or screw drive models. We also offer direct drive models from Sommer. Direct drive models are the most modern and quietest. They have just one moving part. When you choose the right garage door opener or operator for your garage door we can steer you through all the accessories and options available for safety and security. People never give a second thought to their garage door opener when it works. It is the biggest safety and security element on their home. Every person gives their garage door opener a lot of thought when it doesn’t close. Your garage door is the single largest breach in your home if it is not safe and sound. Over the last 20 years garage door openers have gone from being that luxury item everyone wanted to a standard item for every garage mainly because of the instant level of security it gives. When your garage door is closed, the opener locks your garage door. Until you open it, it will stay closed and locked. Some better models offer features that go further than locking the garage door. Garage door opener models can automatically secure the door if you forget to. Some models have a feature that permits you to remotely open or close the door from anywhere in the world. You can let people into your home while you are away. This is handy if you want people to check up on things. Then you can lock up your garage when they step out. Talk about convenient! Good security features give you peace of mind. Our technicians are familiar with all the unusual types of garage doors available in the market today. We offer 24-hour garage door repair, automatic gate repair, and garage door installations. We work on your schedule and come out when it’s convenient for you. Magic Garage Door is licensed and insured to protect our clientele and their property. Call us and let’s choose the ideal new garage door that will go with your with home’s design and beauty.